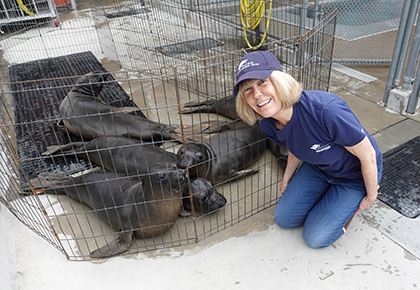 Cindy Lee of the Wags and Menace Make a Difference Foundation completed another amazing trip where she volunteers annually with the Pacific Marine Mammal Center. While there, she works in the ICU, fish school, as well as several other rehabilitation and rescue areas. This trip comes at a time when the west coast seal crisis is at its peak each year. Cindy and her foundation also provides funding for lifesaving emergency medical care and support programs. She also sponsors and helps with the release of rescued and rehabbed seals back into the wild.